Lisa Moreno opened for the defense. (Statements as given by prosecution, may or may not be actual fact as revealed by the court hearing and jury deliberation.) Moreno began by talking about Noor Salman as a mother. She spoke of Mateen’s habitual cheating on his wife, about how he dated other women, usually older. He used his childhood friend Nemo as an alibi for these affairs. Salman was described as a loving mother, taking care of her son. She was so caring that her entire home was child-proofed. Noor was born a Californian Muslim but was not really religious. She was a special needs student, though she managed to get an an associates degree. For a while she served as a kindergarten aide and later worked at Kmart. She only scored 84% on her IQ test, which places her with the bottom 20% of the population. She claims no support for, or knowledge of ISIS. All of her internet searches were just shopping or to read romance novels. She is described by those who know her as, “Simple, sweet, and trusting.” She and Mateen met online, only had a few month relationship and after marriage she was isolated from her family, he controlled all of their finances. She only ever met his family and did things with them, never his friends. Moreno described Mateen as a misogynist, cheater, loser, and a wanna-be-cop. Mateen claimed he was friends with the brothers from the Boston Marathon bombing, that he experimented with bombs, and that he killed a Jewish drug dealer, though the defense says that all of these claims were outright lies. The FBI interviewed him three different times, he admitted to making disturbing remarks in 2014 but nothing was done. He had sworn allegiance to two opposing Islamic groups. Moreno repeatedly referred to Salman's husband as a monster. The reason Noor learned to drive and got her license is because she had recently enrolled her son in preschool. When they went to the Walmart in Vero Beach, they split up, Mateen going to sporting goods, and Salman going to get other things. On June 2, Mateen received a letter from the FDLE and the Criminal Service Standards Office letting him know he could be part of a training program to become a police officer. So, that is why he was okay with spending so much money. The bank warned Mateen not to put Salman on the account because it could become susceptible to her student debt, so instead he named her as the beneficiary. As far as Salman knew all the trips to different locations were were family trips, not “casing” or “scouting” trips. June 11, 2018 was a normal day for Salman. Mateen went to work, came home, and at 3 PM they took their son to McDonald’s. Her husband then purchased the three tickets to California to see her mother and uncles. Nemo, Mateen’s childhood friend, called the FBI to testify when he learned of the attack. Saying Mateen was always cheating with older women he met through online services like Plenty of Fish and Arab Lounge. After Mateen left for Pulse, Salman called her uncle and her friend in California to let them know of her future visit back home. She went to Walmart to get a father’s gift and toys for her child, then she ordered Applebees to go because she thought her sister-in-law might stop over to pick up a toy. After leaving House of Blues, Mateen googled downtown nightclubs and pulled directions up for Eve Nightclub and drove there but then looked up Pulse and went there instead. At 2:30 AM Salman texted Mateen, “Where are you?” and tried to call. At 4:00 AM she was woken up by Mateen’s mother saying that he said he would stop by after prayer but then he never came. “Your mother is worried and so am I.” Reminds him he has to work in the morning. At that point the Fort Pierce police (Lieutenant William Hall) call her out of her apartment so she didn’t get a chance to look up what had happened. Moreno claims the police coerce her and take unrecorded statements. From 4:30 am until midnight they questions her, she never asks for a lawyer and even consents to a home search and a polygraph test. An expert will confirm that she scores 98% in being highly susceptible to coercion. The police utilized the Reed method of interrogation and coercion. FBI told her that if she lied that she would go to jail and never get to see her son again. The defense claims that all of the statements initialed by Salman are provably false – that the GPS tracking in evidence never took them casing around Pulse before June 12, 2016. Mateen had not showed her Pulse online or at the site and told her it was his target. Forensics don’t show that. 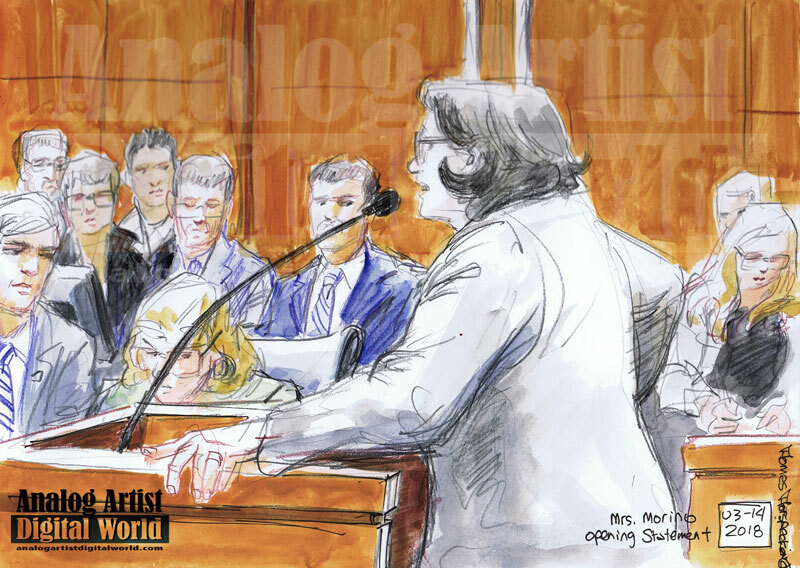 The defense cushioned each statement with, “They got her to say….” The polygrapher wrote three statements in his own hand that she read, agreed to, and initialed. When they let her go, she went to Mississippi, eventually making her way to California, reporting every day to the FBI so they knew where she was and what she was doing. On June 20, 2016 she thanked the FBI for all they had done for her. 7 months later she was indicted and arrested.